The aspect which first struck me was that the whole town has historic charm, not just the bridge. Hobart was the first place settled by Europeans in Australia outside of Sydney, and towns like Richmond followed soon after. It has retained enough of its old buildings to keep a historic ambience, which complements its small-town appeal. In short, it has more character than your average Aussie town and is a pleasure to stroll around. Another of Richmond's assets is its bakery. Near the middle of town, the Richmond Bakery boasts a large range of yummy baked goods, with a cafe so you can dine in with a coffee. When I've been there the coffee was good (not quite excellent), but the food was wonderful. Suffice to say, the Richmond Bakery is one of my favourites in Tasmania. If you're into bakery food, the bakery alone is reason to stop in Richmond. Proximity to Hobart is another plus. You do get some weekend crowds from the city, but most of the time Richmond feels like a small country town. A range of hills forms a sort of barrier between Richmond and the sprawl of Hobart, whose centre is just 24km away. For anyone wanting to explore Hobart but preferring a quiet country base to return to, Richmond is a good solution if you have your own transport ... particularly if you use caravan parks. Hobart doesn't have any centrally located caravan parks. If you're staying in a campervan, caravan, or any of the other caravan park options, choices for Hobart are limited to the outer suburbs or fringes. In my opinion, if you're going to have to commute, you may as well commute a little bit further and stay somewhere nicer than a suburb. 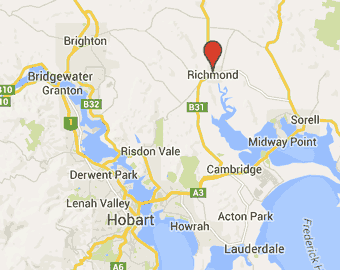 I've stayed in a few caravan parks around Hobart, and liked the one at Richmond best. Not so much for the park itself, but the town it sits next to. On my last Tasmanian trip, when I was driving a campervan, I enjoyed a stay at the Richmond caravan park. A very pleasant way to start the day was to walk the 10 or 15 minutes to the river. 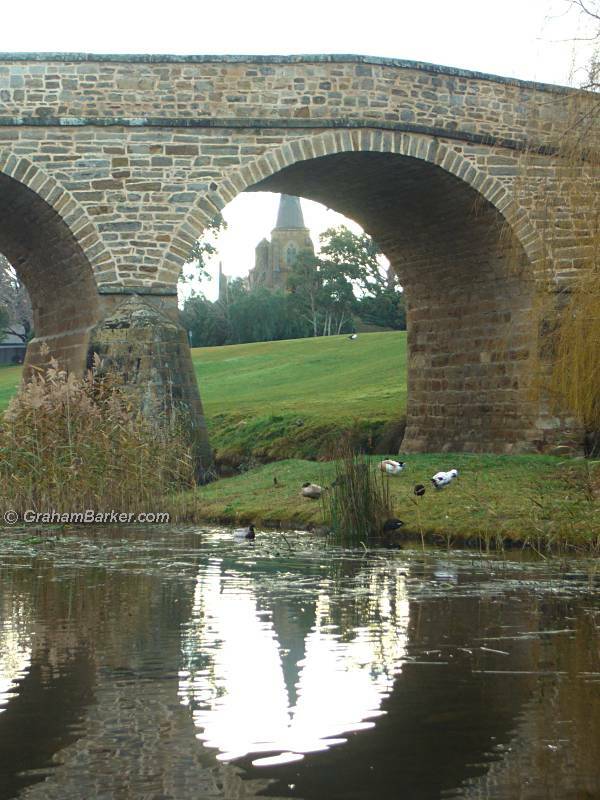 Then stroll along the river bank, near the historic bridge, soaking up the peace and stillness of a new day dawning. Then walk to the bakery for a nourishing (or otherwise) breakfast, followed by the return walk to the van, fortified for the day ahead. 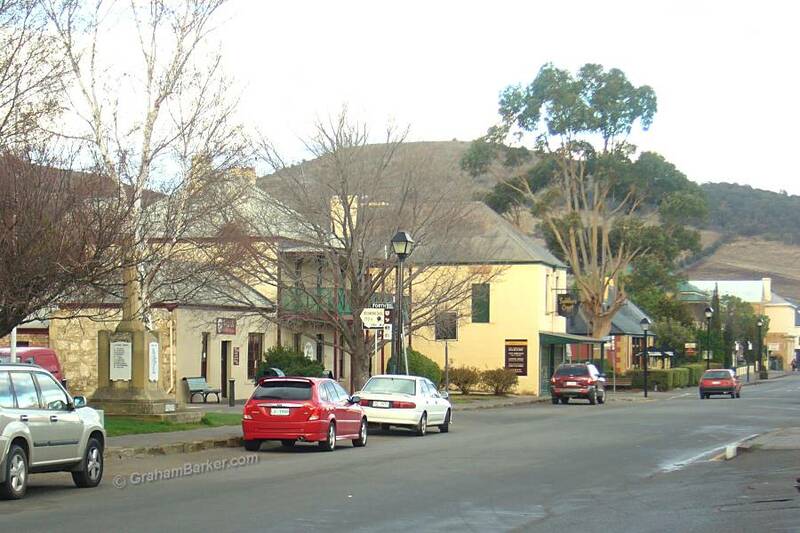 Exploring Hobart is then an easy drive over the hill. Without your own transport, it makes sense to stay in the city when visiting Hobart. But with your own wheels Richmond can be a pleasant base - or, at the very least, a good walk and eat stop on the way to somewhere else.